The past few days we’ve been traveling with the same group of people. We’ve had some really good laughs! Fun crew. Loud, but fun. Here’s to Supa Chef and Speedy Gonzales, Stretch, Mean Gene, Falling Turtle, Trash Can and Irish Charm. And that’s the story of how I became . 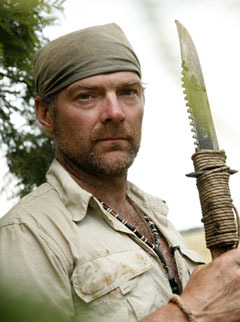 . . Survivorman. PS – I’m not sure I see the resemblance. I mean sure we both wear bandannas and have two eyes, a nose and mouth, but . . . ? But I’m OK with it. He’s a MAN’s man. Have you got one of those mean serrated knives? Ironically, Liz carries that. I have a tough-looking pair of folding scissors.